When a user has multiple email address for the same account, the additional email address can be set up as an email alias to the account. Email aliases are particularly handy for handling multiple domains. When an organization has multiple domains, say yourdomain.com and yourdomain.org, providing multiple email addresses becomes simple by adding aliases to the accounts. Example: patricia@zillum.org, pboyle@zillum.org, patricia@zillum.com can all be the email addresses used by the same person under the same account. The email alias is similar to the base account email address, except that it can be removed and recreated by the admin easily. Login to the Zoho Mail Control Panel. Click on the user for whom you want to add an alias. Provide the alias you want to add and select the domain from the drop-down if you have multiple domains. When the administrator creates a user account and creates an email address for the user, that email address is set as the default email address or default mailbox address for that account. In case there was any error or mix up during the creation of the account, the default email address of the account can be changed. To change the default mailbox address, first the admin should create an email alias with the desired email address, and then set it as default. Go to User Details and select the user for whom you want to change the default Email Address. Create the desired email address as an email alias, in case it is not present. Click the Change link, next to the current default Email Address. In the drop down, select the email alias which should be the default Email address of the account. Click Save to set the chosen alias as the default email address. The additional email aliases will be added to the From drop-down, using which the user can select the From address for the particular email. The email alias can also be used to configure email clients. Email Filters can be used to organize the emails that arrive at different email aliases. Email Forwarding, when being configured from the Control Panel, is done for delegation/ backup purposes. When you configure the email forwarding from an organization account to another account within the same organization, set up in Zoho Mail, there is no verification process required for the process when initiated by the admin from the control panel. When the email forwarding is initiated by the user or to an external email address, the verification process is required to enable the email forwarding. Select the user for whom you want to configure Email Forwarding. Select the Mail Accounts section under Mail Administration. Click Add Mail Forward to create a new forwarding. Specify the email address to which you want to configure email forwarding. Once enabled, all incoming emails will be forwarded to the specified email address. In case you want to forward outgoing emails too, refer Outgoing Forwarding from Mail Policy section. The user will be able to view the configured forwarding. You need to configure Access Restrictions in Mail Policy to hide the Email Forwarding section from the user, to prevent any manual changes by the user. Vacation Reply or Auto Response can be set by the administrator for the user accounts. By this, the admin can set up automatic responses to certain accounts, which would be discontinued or other reasons, which require an auto-response to the sender. Click Add Vacation Reply to create a vacation reply for the user. Once the Vacation Reply has been set, automated replies will be triggered for the emails delivered to the account, based on the sending interval set. The administrator can enable/disable the different email services for a user account. Go to the Mail Accounts section in the Control Panel. Select any user from the listing to open the relevant mail account page. The following are the services that can be enabled or disabled for any user account. From the 'User Details', select the account and navigate to the Mail Accounts section. You can click the 'green' icon for any service to disable the service. The service will be shown in red color. Clicking on it again will enable the service. The administrator can configure user specific signatures for all the accounts in the organization. Select Mail Accounts from the left pane. Select the user for whom you want to configure signature. Click Add User Signature in User Signatures section to create a signature for the user. Enter the signature name and content of the signature. 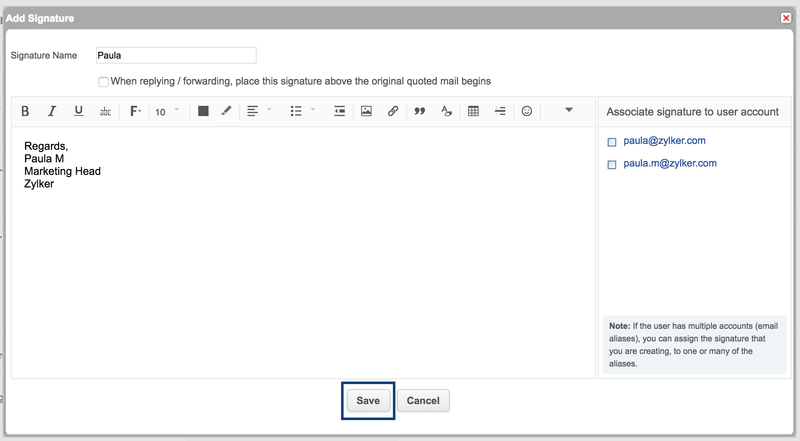 Select the desired email address from the listing to associate the created signature with that email address. The signature will be configured for the selected user. You can decide the position of the signature using the checkbox below the signature name. Users will not be able to edit or associate the signature created by the Administrator.